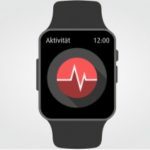 According to Bloomberg, Apple is working on an extended ECG function for the Apple Watch. The use squeezes the frame of the Apple Watch with two fingers and this records an electrocardiogram . ECG features could be standard on wearables in the future. This brings Mark Weiser’s 1999 vision of Ubiqitous Computing a step closer.